The new Information Center will provide details about The Tradition-Buffalo Speedway, which will include Independent Living, Assisted Living and Memory Care. Artist's rendering of The Tradition-Buffalo Speedway. Its new Information Center has recently opened. “We are very excited for our potential residents and their families to have a place to come and find out more about The Tradition-Buffalo Speedway, our first senior living community in Houston,” said Jonathan Perlman, Sr., President and CEO of Tradition Senior Living, LP. 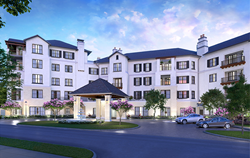 Tradition Senior Living, LP, the owner, developer and operator of high-end senior living communities, announced the opening of The Tradition-Buffalo Speedway Information and Marketing Center in Houston. The new Information Center, located at 9330 South Main Street, will serve as the host site providing information regarding The Tradition-Buffalo Speedway (to be located at 9339 Buffalo Speedway). It will also provide numerous upcoming special events featuring outstanding speakers, local celebrities, and educational events. “We are very excited for our potential residents and their families to have a place to come and find out more about The Tradition-Buffalo Speedway, our first senior living community in Houston,” said Jonathan Perlman, Sr., President and CEO of Tradition Senior Living, LP. According to Perlman the new community will be a continuum of care conveniently situated near Texas Medical Center, the Museum District, entertainment venues and shopping. As mentioned above, The Tradition-Buffalo Speedway will be located at 9339 Buffalo Speedway inside the loop (Interstate 610) in Houston. Tradition Senior Living’s newest community will be on a 7.6-acre tract of land and house 316 units, with the initial opening planned for late 2018. A rental community with no buy-in fee, The Tradition-Buffalo Speedway’s continuum of care will include a 222-unit Independent Living building and a 94-unit Assisted Living/Memory Care building next door. This will be the third community developed by the Dallas-based senior living company, which was founded by Jonathan Perlman, Sr. The Tradition-Buffalo Speedway will boast the same hallmarks of Tradition Senior Living’s first two communities: resort-style living with ultra-inclusive services and amenities: beautiful, light-filled apartments and common areas; lush landscaping and courtyards; an underground parking garage; restaurant-style dining in multiple venues; daily activities; transportation; and wellness programs. State-of-the-art fitness areas include an indoor pool, a weight room, a Pilates room and a group-exercise room for classes taught by an in-house fitness instructor. Design has been another hallmark of Tradition Senior Living, and this community will be no different. It will continue the classic, elegant themes already established by Tradition Senior Living – beautiful English antiques in airy, livable rooms – but with a Houston sensibility. Tradition Senior Living is a Texas limited partnership engaged solely in the development, construction and management of a growing number of Tradition Senior Living developments. Management is administered in-house with personnel who have corporate-level experience in the senior living industry. Founder and CEO Jonathan Perlman has worked in the senior living industry for the past 20 years and has experience in all phases of the business. Prior to founding Tradition Senior Living, LP, Perlman was involved in the development, finance, construction, marketing and management of nine senior housing projects totaling more than 1,800 units. Tradition Senior Living’s Dallas communities comprise a total of 639 units across two campuses. The first community, The Tradition-Prestonwood, opened in 2010; the second, The Tradition-Lovers Lane, opened in 2015.